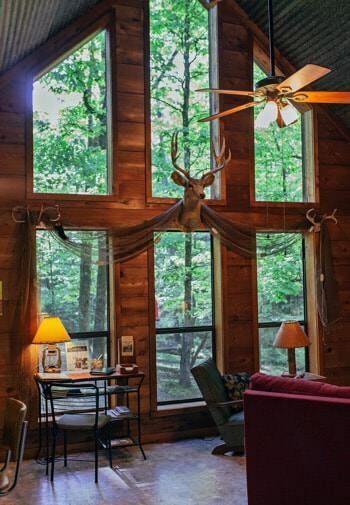 Our properties are located on a secluded 50-acre area in the foothills of the Ouachita Mountains in Arkansas. We are only 5 miles from DeGray Lake and 15 miles from Hot Springs National Park. At Lone Cedar Cabins we offer cozy lodging accommodations in the great outdoors where roughing it means relaxing in front of the fireplace, watching the wildlife from the covered porch and snuggling into a queen-size bed for a good night’s sleep. All of our cabin rentals have the most beautiful and secluded views. Just a short drive away, take a splash in the picturesque DeGray Lake. You will find that they offer equipment to enjoy lots of fun water sports for your vacation getaway. Take a fascinating day trip to the famous Hot Springs for shopping, historic sites, sightseeing, and a healthful soak in the mineral rich hot springs. Just outside the front door enjoy a lively game of horseshoes while delicious barbecue is grilling. 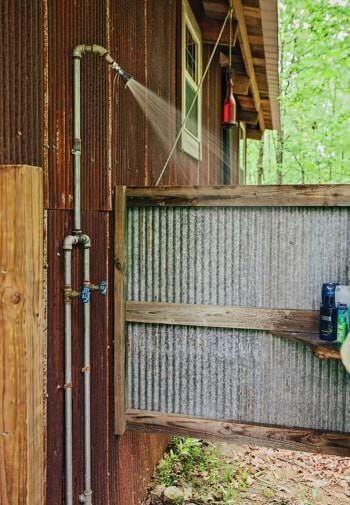 Your outdoor shower is a must! Walk to the catfish pond and you might catch tonight’s supper. While you’re there, enjoy our old fashioned swing set and please feed the Koi – cheerios and bread are their favorite. Another adventure is our trail, which goes to the top of our mountain. At about 1000’ elevation, it has an impressive view. Hiking sticks are provided. You’ll see our crystal clear spring that runs year-round. Look out for Big Foot! It is our hope that our passion for detail is evident in the building and decoration of our cabins. We have personally torn down old houses and barns. Each reclaimed piece is used with care and thoughtful placement. The landscape that surrounds us is our inspiration. The peaceful valley with its endless trees sets our minds at ease and is the perfect medicine even on the most stressful of days. If you haven’t visited Lone Cedar Cabins yet but want a taste of a simpler time, let us be your choice. It will be a decision you and your family will cherish.